It’s going to become every harder for our own government to remain silent over an increasingly hard line taken by Western countries against the penetration of Huawei technology in Europe. Malta is committed to a close partnership with Huawei and 5G technology here is being rolled out exclusively using Huawei technology. There are signs that sensitive government infrastructure is also using Huawei technology. Official buildings used by Malta’s President are believed to be using Huawei technology. These buildings recently hosted sensitive talks with the President of Tunisia who was on a state visit in Malta. DW reports here on statements made by US Secretary of State Mike Pompeo. The United States said on Monday it would share its knowledge of risks involving Chinese telecoms giant Huawei with European countries. “If that [Huawei] equipment is co-located where we have important American systems, it makes it more difficult for us to partner alongside them,” US Secretary of State Mike Pompeo told journalists gathered at the US Embassy in Budapest, Hungary. 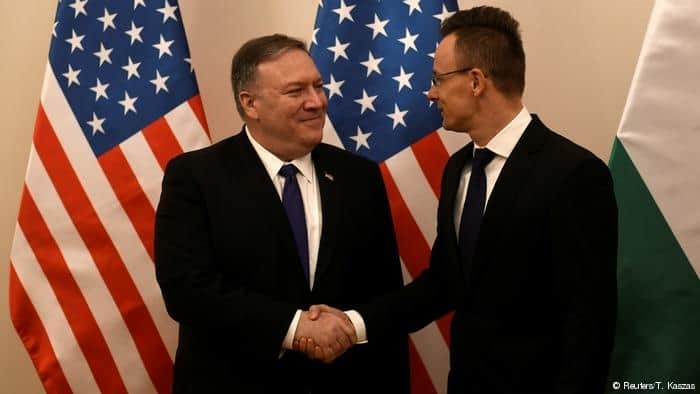 Mike Pompeo was in Hungary for the first leg of his five-nation tour of Europe. DW reports that ‘the US is spearheading a drive to ban or restrict the engagement of Chinese firms such as Huawei in the West following the company’s alleged espionage activities in Poland. Huawei said it dismissed a Chinese worker arrested in Poland on allegations of spying for Beijing. Once again it would be appropriate for our own government to tell us if the United States has communicated with them any concerns about the planned use of Huawei technology at all levels of Malta’s telecommunications infrastructure.